Frederick M Hocker’s hypothetical reconstruction of a tenth-century bireme dromōn, based on the few contemporary documentary sources. An Arab heavy warship would have looked similar in many respects. 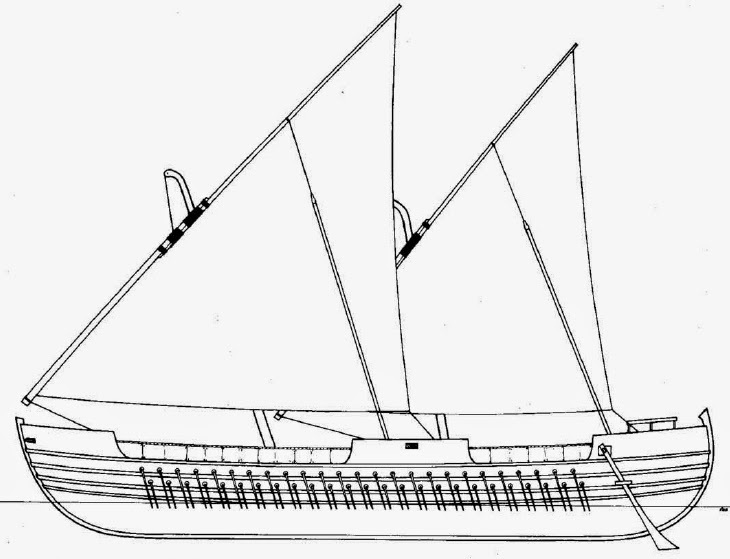 Arab ships were similar enough to Byzantine warships that they were often referred to as dromōns as well, in both Greek and Arab sources, and the Greek terms chelandion, galea, and dromonarion also found their way into Arabic naval terminology, with shalandi one of the most common Arabic terms for large, dromōn-like ships. The main Arab ships were considered to be larger, heavier and slower than their Byzantine opponents. Arab types that do appear to be more specific include shalandi, shīnī and ghurāb for galleys and musattah for a large, decked galley common in later periods, especially in the Crusades. Another Arabic type of note is the harrāqa, or ‘fire ship’, which is the type most often equipped with Greek fire. By the middle of 1944, Vlassov’s formation, the Russkaia Osvoboditelnaia Armiia (ROA – the Russian Army of Liberation) was not an army in the sense of a military organization. 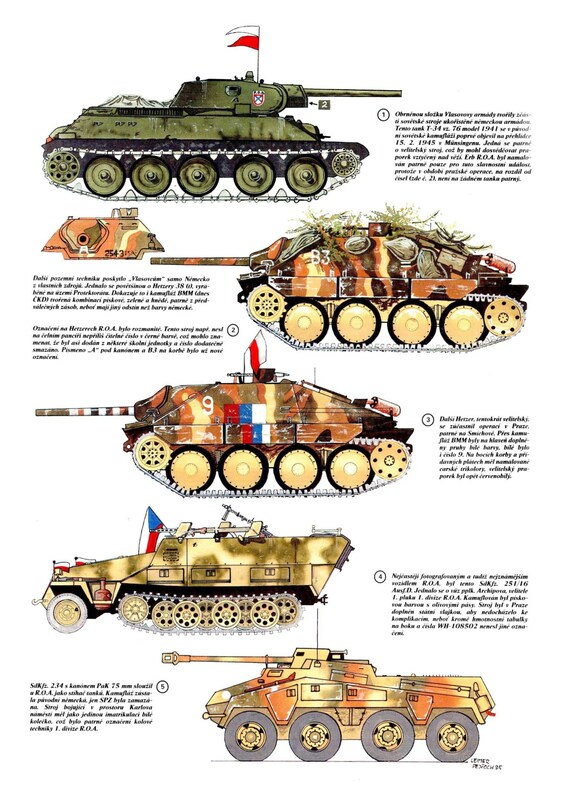 Units that bore its name were mostly commanded by German officers, and were dispersed all over Europe. General Vlassov and his Russian National Committee had no influence whatsoever, and were not recognized by the German Government. In July 1944, however, Himmler, seeing the dire situation the Reich was in, decided to meet with Vlassov (the Reichsführer-SS at this time had great power, being Chief of the SS, Chief of the Police, including the Gestapo, Minister of the Interior and, since the attempt on Hitler’s life on 20 July 1944, also Commander of the Reserve Army). Because of the attempt on Hitler’s life, the meeting did not take place until 16 September 1944. Himmler agreed to the creation of a new committee called the Komitet Osvobozhdeniia Narodov Rossi (KONR – Committee for the Liberation of the Peoples of Russia), and to the creation of the KONR Army under General Vlassov’s command. The committee and army were to embrace all Soviet citizens living under German rule, in order to unite their political and military activities in the fight against Bolshevism. To begin with, five divisions were to be organized from among POWs and workers brought to Germany from the occupied territories in the East (by this time, the Red Army had entered Poland, reached East Prussia and was at the Yugoslav border). The representatives of the non-Russian nationals, who wanted to sever all ties with Russia and create their own independent states, were against the idea of the KONR Army. Despite Himmler’s threats, the Ukrainians, White Ruthenians (a former province in eastern Czechoslovakia), Georgians and Cossacks refused to join the KONR. On 14 November 1944, the Committee for the Liberation of the Peoples of Russia held its inaugural meeting in Prague. The Prague Manifesto was proclaimed detailing KONR’s aims: the overthrow of Stalin’s tyranny, the liberation of the peoples of Russia from the Bolshevik system, and the restitution of those rights to the peoples of Russia which they had fought for and won in the people’s revolution of 1917; discontinuation of the war and an honourable peace with Germany; and the creation of a new free people’s political system without Bolsheviks and exploiters. All decisions and instructions had to be “coordinated” with the appropriate German commissar. Nevertheless, the publication of the Prague Manifesto made a deep impression on many Russians. First of all, it brought forth a great number of voluntary applications for service in the KONR Army, a number that surpassed all expectations. On 20 November, for example, 60,000 applications were received. Large numbers of volunteers from among POWs and Soviet refugees who had left their native lands voluntarily with the retreating German armies, preferring a wandering life in strange and perhaps unfriendly lands to a return under the NKVD yoke, were received. Bizarrely, desertion from the Red Army to the Germans increased after the publication of the manifesto, despite the looming defeat of Nazi Germany. The KONR Army had begun to form in November 1944, accompanied by shortages of arms and equipment. As a result of the deteriorating military situation in the East, the five divisions were reduced to two. Despite his difficulties, Vlassov formed an army headquarters, two motorized divisions, one reserve brigade, an engineer battalion and support units – a total strength of 50,000 men. On 28 January 1945, he officially took command of the army. The 1st KONR Division, under the command of General Sergei Kuzmich Bunyachenko, was given the name 600th Panzergrenadier Division. Its organization began in November 1944 at Muensingen, and operational readiness was reached in mid-February 1945. The nucleus of the division consisted of the remnants of the 30th SS Waffen Grenadier Division (Russian No 2), which had been greatly reduced during the fighting in France, and the remnants of the infamous Kaminski SS division. When the rabble of the latter formation arrived at the camp where the division was being formed, gangs of armed and unarmed men in all kinds of uniforms, accompanied by women in gaudy dresses, spilled out of the railway carriages. At the sight of them, Bunyachenko exclaimed in anger: “So this is what you’re giving me – bandits, robbers, thieves. You’ll let me have what you can no longer use!” Amazingly, despite acute shortages of arms, equipment and supplies, at the beginning of April the division reached the front on the River Oder. The 2nd KONR Division, under the command of General G. A. Zveryev, was named the 650th Panzergrenadier Division. Its formation began in January 1945 in Baden, some 69km (43 miles) from the camp of the 1st Division. Owing to the shortages in arms and equipment, it never really reached operational readiness. The nucleus of the division consisted of a few battalions withdrawn from Norway, and some recently captured Russian prisoners. In addition, the KONR Army’s headquarters, the reserve brigade, the engineer battalion, the officers’ school and other units, in all some 25,000 men, were being formed in the same area as the 2nd Division. The organization of the 3rd Division was begun in Austria, but its strength apparently never exceeded 2700 men. In mid-April 1945, the 1st Division was given the task of capturing the Soviet bridgehead in the area of Frankfurt-on-Oder. This bridgehead had been previously attacked by the Germans, but without success. The attack of the 1st Division also failed, with heavy losses owing to lack of adequate artillery and air support. After the failure of this attack, Bunyachenko withdrew the division on his own authority, and a few days later began the march towards the frontier of Czechoslovakia, together with other Russian volunteers – more than 20,000 men in all. On the way, the Germans tried in vain to induce him to obey their orders. At the end of April, the division reached the frontier of Czechoslovakia where Vlassov himself joined it. On 2 May, they stopped short of Prague where they were informed that the army’s headquarters, 2nd Division and the remaining formations of the KONR were on their way through Austria to Czechoslovakia. At this time, Prague seemed to be the objective of both the American and Soviet armies which were approaching from two directions. This induced the Czechoslovak National Council to call for an uprising against the Germans, which began on 5 May. On the same day, the Czechs implored the Allies by radio to come to their aid because Prague was threatened by the Germans. Receiving no reply to its appeal, the council turned for help to General Bunyachenko. On the morning of 6 May, the 1st Division joined the fight, and by the evening had cleared Prague of SS troops. The Czechs greeted Vlassov’s men joyfully, but the next day Bunyachenko was informed that Prague would be occupied by the Red Army, not by the Americans as he had expected, and that the Czechoslovak National Council was being replaced by a pro-Soviet government headed by Eduard Benes. The latter demanded that the forces of General Vlassov were either to await the Red Army’s entrance in order to surrender, or leave Prague as soon as possible. On the morning of 8 May, General Bunyachenko’s troops began to march towards the same area from where they had come only four days before. A few days after leaving Prague, the 1st KONR Division laid down its arms in the Czech village of Schluesselburg in the American zone. On 12 May, Bunyachenko was informed that Schluesselburg would be included in the Soviet zone, and that the local American commander did not consent to letting the division march beyond the new demarcation line. The only possible solution, suggested the Americans, was that the soldiers of the KONR might try to cross over to the American zone individually. General Bunyachenko immediately disbanded the division, advising his subordinates to try their luck on their own. During the flight, however, many were shot by Soviet troops and the majority were captured by the Red Army. Some 17,000 of them are said to have been deported to Russia, where they suffered death or life imprisonment. General Vlassov himself fell into Soviet hands on 12 May. The 2nd KONR Division split into two parts; the greater part, together with the Pannwitz’s Cossack corps, surrendered to the British on 12 May in Austria, to be interned in the area of Klagenfurt. One regiment of the 2nd Division and the army’s headquarters reached the American zone after a long and weary journey, and were interned at Landau in western Bavaria. Thus ended the saga of the ROA. The possible importance of the Sassanian influence on naval developments in the Middle East has only recently been considered. During their brief occupation of much of the eastern Mediterranean littoral, they had extended as far as to occupy the Greek island of Rhodes, plus some Anatolian coastal towns, though they almost certainly used captured Syrian, Cilician, Egyptian or Greek ships to do so. The subsequent Muslim conquest of many of the same regions brought the Arabs to the shores of the Mediterranean for the first time as a great military power and as the inheritors of Sassanian naval traditions. On the other hand the Arabian peoples had a far more active naval heritage than their initially cautious attitude to the Mediterranean might suggest. The pre-Islamic Yemenis and perhaps Omanis had, for example, been raiding Sassanian territory by sea since at least the 4th century AD while various other tribes from both the Gulf and Red Sea coastal regions of Arabia had similar maritime traditions. Here it is worth noting that, following the first wave of Islamic conquest, these same Yemeni and other coastal Arab tribes were often selected as garrison troops for strategic coastal bases including Alexandria. In response to the challenge by new Arab-Islamic fleets, a more powerful Romano-Byzantine navy would emerge in the late 7th century. The ‘Battle of the Masts’ would not be the last naval encounter between these two rivals. Indeed, later Byzantine attempts to retake Egypt would convince Mu’awiya, the governor of Syria and subsequently the first Umayyad Caliph, of the need for a full Islamic navy in the Mediterranean. The first such fleet was built in Egypt, where all qualified sailors were registered for naval service. Although many of these sailors were in fact Christians, the bulk were Yemeni in origin and Muslim in religion. The new fleet used Tyre and Acre as forward bases while Iranian and Iraqi shipwrights were brought from the Gulf to build and man the new or restored shipyards at Acre, Tyre and Beirut. Other naval bases and fleets were established in newly conquered Tunisia and rather later in Libya; the resources of wood, iron and tar essential for medieval naval warfare all being available in North Africa. From the early 8th century onwards these new Islamic fleets undertook almost annual raids against Byzantine territory and islands in the western Mediterranean, mirroring the annual raids undertaken on land. If there were any real differences between Byzantine and early Islamic warships, it would seem to have been in the increased height of the forecastle of the latter. This was soon being used to mount stone-throwing engines and to provide an advantage when boarding enemy vessels. The main fighting ship was a galley called a shini which, like the Byzantine galleys of the day, had between 140 and 180 oarsmen. It is also important to note that, with very few exceptions, the oarsmen in medieval galleys, be they Christian or Muslim, were paid volunteers not slaves. 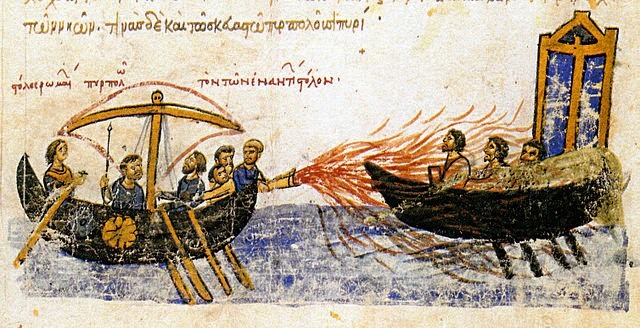 By the mid-8th century such galleys defended themselves against the terrifying Byzantine incendiary weapon known as ‘Greek fire’ using various systems of water-soaked cotton, and would shortly use Greek fire themselves. However, the vessels of the rival naval powers remained remarkably similar, as there was an exchange of both technology and terminology between them. The main difficulty facing any Islamic fleet continued to be a lack of timber. Indeed, this lack of resources may have stimulated the construction of larger ships, which were better able to defend themselves and were no longer regarded as expendable assets. Certainly, there was also a change from the hull- or skin-first method of construction to the more economical frame-first method, although this change would not be truly complete until the 11th century. 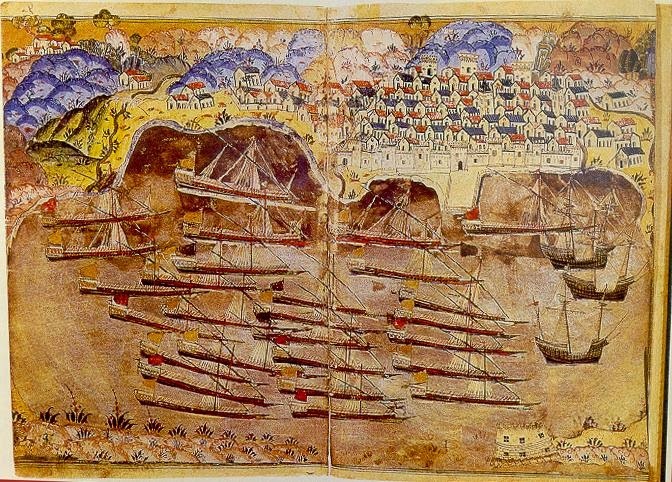 Barbarossa’s fleet wintering in the French harbour of Toulon, 1543. During the mid- to late fifteenth century, the Kingdom of Portugal took the early lead in exploring the world via the oceans. They were looking for trade routes to bypass the famed Silk Road to China, as well as ways of obtaining rare spices and other products that were being monopolized by the Venetians. By 1500, Portuguese colonies or trading posts had been planted on the west African coast (Angola) and the east African coast (Mozambique). These colonies were used as stepping stones on the way to the Indian subcontinent. Fort Kochi, on the southwest coast of India, was established by the Portuguese in 1503. The Portuguese managed to establish trading agreements with several Indian rulers, with mixed results. By 1508, the Europeans had managed to get on the wrong side of a coalition of various nations, including the Calicut, the Sultan of Gujarat, the Mamlûk sultan of Egypt and the Ottoman Empire. A Portuguese fleet of 21 vessels had been dispatched to the Indian Ocean in 1505 to add some muscle to their nation’s presence in that area. They were under the command of Portugal’s First Viceroy, Dom Francisco de Almeida, who had been appointed to represent the interests of Portugal in India. 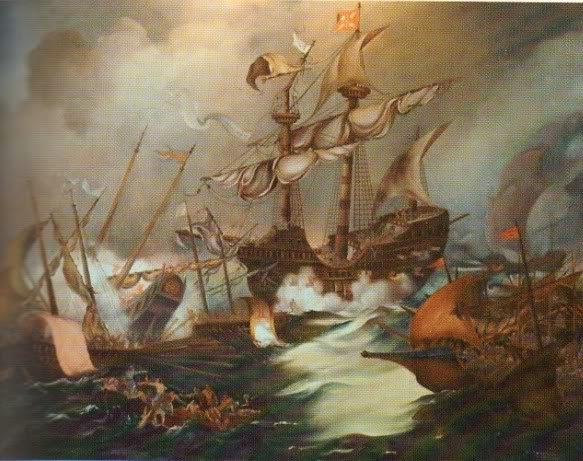 In opposition, the Ottoman sultan had provided some galleys to Egypt, in order to counter Portuguese interdiction of the Malabar timber trade from India. The Mamlûks – with some technical assistance from the Venetians – disassembled these galleys in Alexandria and reassembled them in the Red Sea below Suez. These galleys then had to navigate the Indian Ocean, a dicey situation considering that the galleys were constructed to sail on the Mediterranean Sea. Mostly hugging the coast, the Turkish- Mamlûk fleet arrived off the coast of Gujarat, one of the Muslim kingdoms on the coast of India. The Sultan of Gujarat had previously contacted the Ottomans, recommending that a sufficient naval force could help tip the balance of power and allow large portions of India to be added to the Ottoman Empire. The only major force standing in the way of that plan was the Portuguese. The Portuguese fleet, now numbering 18 vessels, left Fort Kochi in late 1508 and sailed north along the west Indian coast, seeking the Ottoman-Mamlûk fleet. They stopped at various ports along the way, either picking up provisions or attacking enemies, giving their soldiers experience. Ottoman admiral Mir Hussein Pasha, probably following standard Mediterranean tactics, anchored his fleet in the harbor of the port of Diu. This port had a fort with its own artillery, which Hussein Pasha hoped to use to support his fleet. The Ottoman-Mamlûk fleet had received reinforcements from the Sultan of Gujarat and the ruler of Calicut. However, these reinforcements were small, shallow-draft vessels little better than fishing boats. 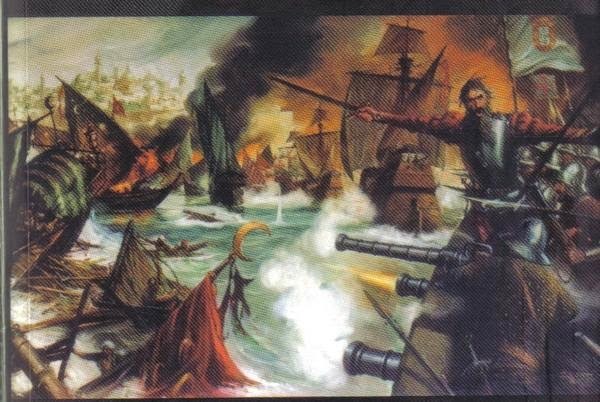 Eventually, on February 2, 1509, the Portuguese fleet discovered the enemy fleet in Diu’s harbor and prepared to attack the next day. The Turkish fleet was anchored in the inner harbor of Diu, with a treacherously narrow and shallow channel to navigate. However, the Portuguese found an 18-year odd native who was familiar with the channel and offered to help in exchange for his freedom. One bergantim (brigantine), a smaller, two-masted vessel with a square sail on the foremast and lateen-rigged on the other. At this time period, it was probably also equipped with oars. As mentioned above, the Portuguese vessels had a large complement of fighting men, trained for sea battle, armed with arquebuses and primitive grenades. The Turkish fleet marines, trained for fighting in the Mediterranean, wore almost no armor and were mainly archers. 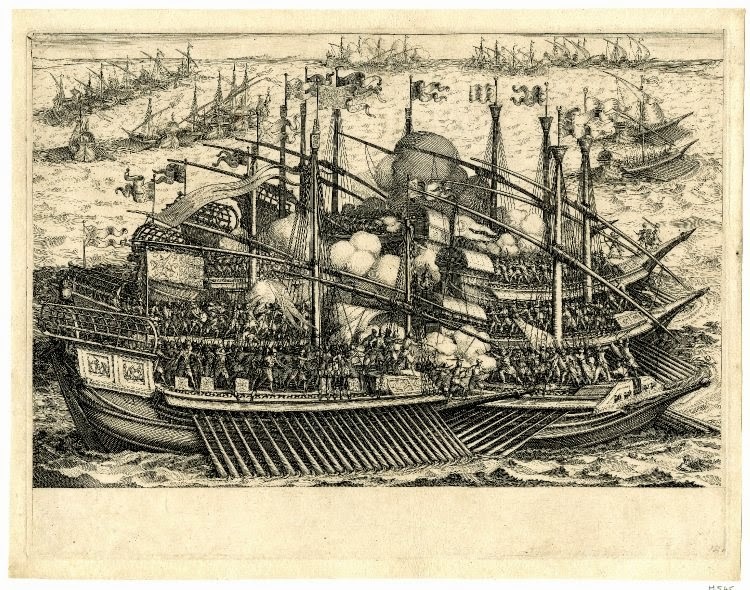 Also, the Portuguese ships sat higher in the water, and were almost impossible to board. Further, their cannon could bombard any enemy vessel attempting to approach them for boarding action. The battle started at about 11 a.m., when the prevailing winds and the incoming tide were favorable. The Portuguese began a major bombardment of the artillery batteries guarding the port and the Turkish fleet. Then, when the Turkish and Gujarati vessels refused to leave the “safety” of the harbor – as Almeida anticipated – the Portuguese moved in to engage the enemy. The superiority of the state-of-the-art European vessels became obvious as, for the next six hours, the Portuguese blasted the enemy vessels with full broadsides, grappled and boarded the enemy ships, capturing two Turkish naus, two Gujarati naus and the two Turkish gales in bloody hand-to-hand fighting. In addition, two Turkish naus, 2 Gujarati naus and two Turkish caravelas were sunk. By five o’clock, the wind began to change and Almeida ordered his fleet – which lost no ships despite one of his naus sustaining heavy damage – to leave the harbor with some of their prizes. The next day, Viceroy Almeida demanded the return of the men captured at the battle of Chaul, which was accomplished within the hour. He further demanded reparations of 300,000 gold xerafins (about 180,000 rupes). The ruler of Diu offered to give his port to the Portuguese, but Almeida turned that offer down, as he felt it would be too expensive to rule – but he did leave a garrison in the city. The Portuguese fleet stayed in the area for several days; the ruler of Diu, grateful that the Europeans did not loot his city, almost daily sent them a boat loaded with “… sheep, hens, eggs, oranges, lemons, cabbages, etc.” as well as rich gifts. Almeida refused a gift of a brocade tapestry and a string of pearls, which he instead sent home to the Queen of Portugal. Nine days after the battle, the Portuguese fleet headed back south. Casualties from the battle amounted to 32 Portuguese dead, and about 300 wounded. The combined enemy dead were estimated at 3000 killed and an “even larger” number of wounded. The Egyptian and Turkish prisoners were treated…well, badly. Almeida, in retaliation for his son’s death, ordered most of them to be hanged, burnt alive or torn to pieces by tying them to the mouths of cannons, then firing them. Writing about the battle afterwards, the Viceroy said, “As long as you may be powerful at sea, you will hold India as yours; and if you do not possess this power, little will avail you a fortress on the shore.” Several of the captured Turkish and Gujarati vessels were sold as prizes, with portions of the money distributed to the fleet sailors and marines. Among the more long-standing reminders of this fight were three royal battle standards of the Mamlûk sultan of Egypt captured at this battle. They were sent home to Portugal, where to this day they hang in the Convent of the Order of Christ in the city of Tomar, formerly a stronghold of the Knights Templar. Later generations of Europeans, from the seventeenth century on, would grow increasingly confident, even complacent, regarding their military superiority over the East (excepting such scares as the 1683 siege of Vienna). There was no such confidence in the fifteenth and sixteenth centuries. Then, a long string of battlefield victories indicated that the Muslim world, particularly the wealthy, populous, militant and expanding Ottoman Empire, had every chance of stretching its grasp to seize first Sicily or Vienna, then Naples and Rome, and finally all of western Europe. This was by no means an improbable, or even unlikely scenario. The sultan planned for it, sending his armies and fleets west. In response, the European powers fretted, drew themselves together in a sequence of Holy Leagues and prepared for the sultan’s blows. Only the most powerful of Christian princes, ‘his most Catholic majesty’ the King of Spain, could direct his own sustained offensive east to match and meet the Turk. The battles of East versus West were of course fought along the shores of the Mediterranean and the banks of the Danube. But there were more exotic, farther flung points of conflict as well: the Renaissance struggle between Muslim and Christian European was the first truly global war. Portuguese exploration into the Indian Ocean in search of pepper, cloves and nutmeg (and also the fabled Eastern ally for the war against the Moors, ‘Prester John’, eventually identified as the black Christian king of the Ethiopian highlands) brought the age-old conflict of crusader and Ghazi to the monsoon-lands of Asia and East Africa. In 1498 Vasco da Gama made landfall in India. The Portuguese governors ‘of India’ (their brief actually included the whole of the Indian Ocean) who followed da Gama brought the customs of the Iberian Reconquista – fire and sword – to the work of carving out a maritime empire: this was no mere commercial creation. Afonso da Albuqerque seized Hormuz in 1509, Goa in 1510 and Malacca on the Malay Peninsula – gateway to the spice wealth of the East Indies – in 1511. These were all Muslim cities. Between 1503 and 1513 the Portuguese almost annually raided into the Red Sea; in 1517 they almost seized Jiddah, the very port of Mecca. The Mameluke sultan in Cairo (until 1517) and thereafter the Ottoman sultan had to respond to these provocations. In 1508 a Mameluke fleet co-operating with Indian Muslim rulers surprised the Portuguese at Chaul off the coast of India, but this Muslim-allied fleet was destroyed the following year. In 1538 a large Ottoman army landed at Diu in India, but failed to take the Portuguese city despite the support of a massive siege battery of 130 guns. In 1552 the Ottomans attacked but failed to retake Hormuz; Portuguese counter-raids reached Basra in southern Iraq. In 1567 as many as forty Ottoman ships arrived at Sumatra to aid the Muslim sultan of Atjeh. Significantly this expedition coincided exactly with a peak in Ottoman activity against the Christian powers in the Mediterranean. This was indeed a world war. According to Herodotos (6.15.2), the 100 Chiot triremes at Lade in 494 BC each carried 40 picked hoplites serving as epibatai Herodotos (7.184.2) mentions that Persian triremes carried, in addition to native marines, 30 additional fighting men who were Persians, Medes or Sakai, the last of whom were a nomadic people of central Asia, highly valued for their archery skills. Every Persian ship was supplied by Persian subjects, including Phoenicians, Egyptians, Carians, Cypriots and Greeks, among others. The non-seafaring Persians supplied only admirals and marines. The last were probably on board to ensure the loyalty of the ship’s company and for that reason they were undoubtedly carried in battle. The ten epibatai on an Athenian trireme had the highest status in the ship after the trierarchos. They are mentioned second in the Decree of Themistokles, and this is the position they occupy in the 4th-century crew lists (IG 22 1951.79-82). Thucydides notes that they joined the trierarchos in pouring libations at the ceremonial departure of the Sicilian expedition (6.32.1). One reason for the Athenian practice of taking only a few hoplites on deck to serve as marines was that the crew’s pulling efficiency was seriously jeopardized if there were too many people moving about topside. Such movement inevitably caused the ship to roll. Under oar, therefore, the epibatai had to be seated (Thucydides 7.67.2), and the procedure appears to have been to keep them centred on the middle line of the ship. Once the vessel had stopped to board an enemy vessel, the epibatai would leap up to fight once the ships grappled. In his speech before the final sea battle in the Great Harbour at Syracuse, the Athenian commander Nikias revealed another reason: ‘Many archers and javelineers will be on deck and a mass of hoplites, which we would not employ if we were fighting a battle in the open sea, because they would hinder us through the weight of the ships in exercising our skill.’ (Thucydides 7.62.2) Weight, particularly on deck, prevented the triremes doing what they did best, namely, conducting the tactical manoeuvres in which speed and agility were essential. The four toxotai were distinct from the ten epibatai, namely they were not carried on deck. An inscription (IG I2 950.137), dated to 412/411 BC, gives them a descriptive adjective, paredroi, meaning ‘sitting beside’. It seems that they were posted in the stern beside the trierarchos and kubernetes and acted as their bodyguard in action. The helmsman would certainly have been vulnerable and would have needed protection, being too busy to defend himself. The Athenian playwright Euripides (Iphigenia among the Taurians 1377) talks of archers stationed in the stern, giving covering fire during an embarkation.